What Happens When You Go To Vote? Everything you want to know about the 2020 Census: Get the facts, understand the consequences, consider the concerns and intentions of the Framers, and what it means today -- Livestream Video of the 2020 Census Talk. You are there! See and hear the January 27 talk on the upcoming 2020 census here. And ... everything you want to know about the Electoral College: What it is, what it does, what to do about it. See a presentation, given by LWVTO President Peggy Dellinger on February 17 in Spring Lake, here. For more information, see the work of LWV in Illinois, which has researched issues of the Electoral College, and put together informative presentations, here. 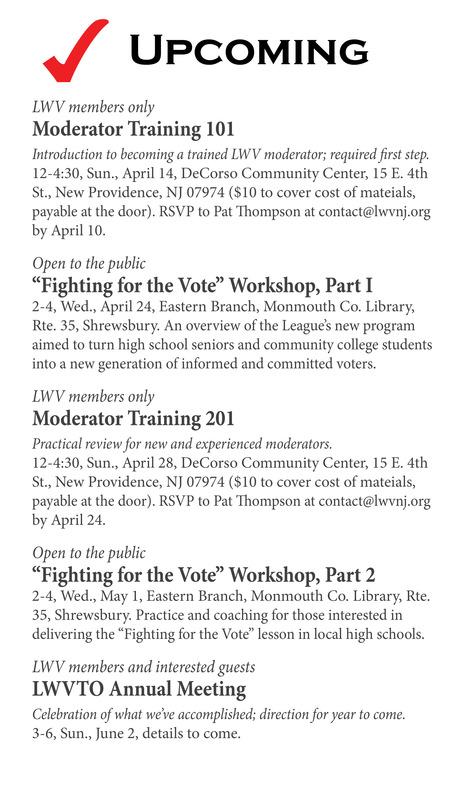 LWVNJ has prepared a two-page leaflet detailing voting rights, wrongs, problems, and who to contact. Read it below (the box scrolls), or download a copy here. The Election Division of the Monmouth County Clerk's office has a new website with helpful information about how to register, where to vote, election results, voting by mail, and many more topics, including how to contact the office for further information or answers to questions. Also available are any forms necessary, with details on where to send them. 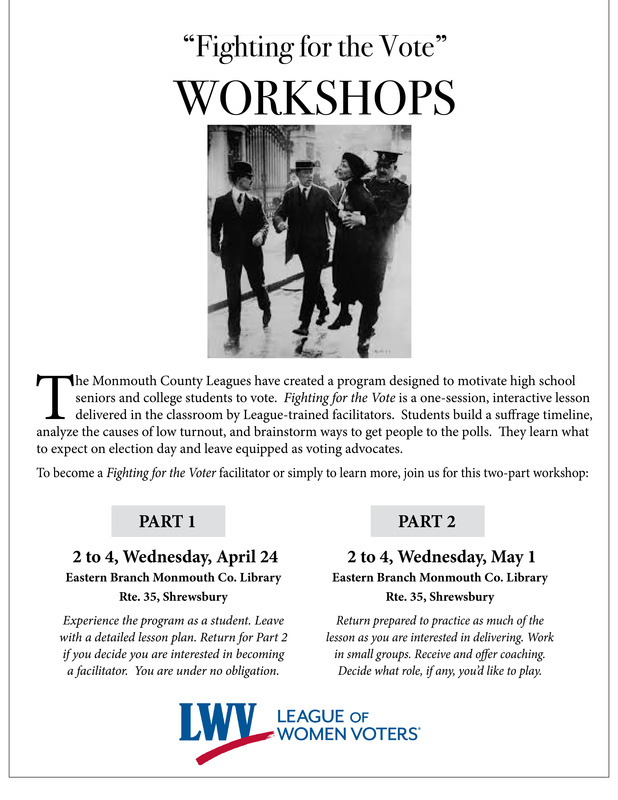 The League of Women Voters is a pre-eminent source for voter service education and has provided nonpartisan information to New Jerseyans for nearly 100 years. As a grassroots organization the League works to build participation in the democratic process and educate the public on key community issues. Come join us! Download and print this Membership form and send it to the address at the bottom of the page.